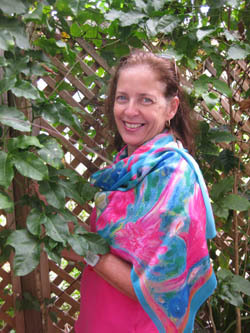 How to Wear a Scarf Creatively - Join in This Fun Competition! Read on if you have a few interesting and creative ideas about how to wear a scarf and can come up with some original poses and settings for this fun photography competition. Today I am launching a photo competition, open to anyone involved with my gorgeous and sensual, originally designed and hand made, pure silk scarves. You may have purchased one (or more) or been given one by a friend or relative. Perhaps you have a friend who likes modelling in front of a camera and would enjoy posing for you? Or a friend may like to photograph you in action? Perhaps you are about to become the proud owner of one or two new scarves? 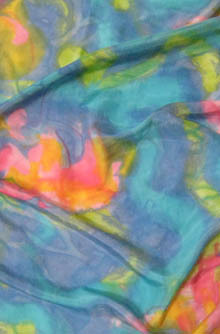 They are designed and made in Australia using top quality pure silk, printers and sewers - nothing but the best for you! With care they will last a very long time (perhaps becoming a family heirloom?). Your involvement with the scarves may even be limited to borrowing one! Perfectly acceptable! 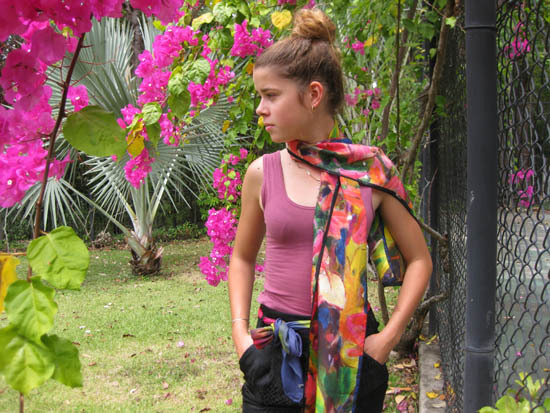 Using your creativity and ingenuity, see how you can show the beauty and versatility of the scarves by working out various ways of wearing them. The setting of your photo may be as bizarre or unusual as you wish (eg on top of the Sydney Harbour Bridge on a windy day? Deep in a dark jungle, strolling along a deserted beach...even sky-diving?). Or simply your normal/elegant every-day or special occasion self. Consider what to wear with the scarf (or scarves). A plain colour is usually best. Your model may be dressed for a formal occasion or pretending to be a nymph in the forest - anything goes! 'Selfies' seem to be all the rage at present so if that is what you want to do maybe you can become a contortionist or set up the camera with a remote control? The quality of your photograph will reflect your creativity, as mentioned, but you will need to keep other criteria in mind, too. 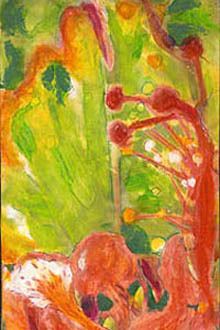 Interesting composition, a sense of movement, contrasts and harmonies are all aspects to consider. You may also enter digitally created images, which use the scarves in an imaginary way - eg included in a photo that you have taken of clouds, jungle, yachts, snow, beaches etc. In this case you have my permission to 'copy and paste' images from the website for this purpose. You may enter up to three photographs for consideration. All entrants, whose photos appear on this site, will have a link to their website (if they have one) included as a courtesy and thanks to them. Jasmin strikes a casual pose. More pics of my lovely teenage models here. 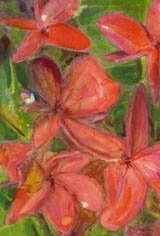 First - Top of the range pure silk satin georgette wrap, 'Flowering Gingers' design, valued at $330, plus earrings of your choice from the current range! See this beautiful wrap here. 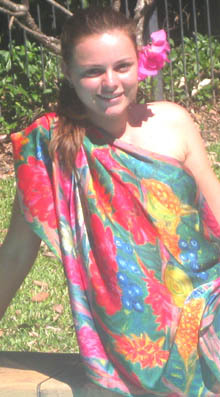 Second - Choice of 'Tropical Flowers', pure silk long scarf, valued at $135, plus matching earrings. 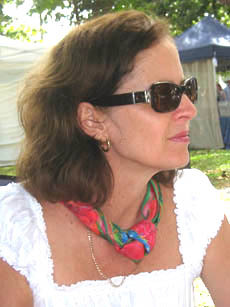 Jasmin wears one of the long scarves, above. 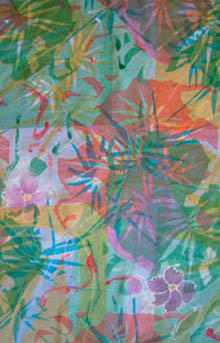 Third - Choice of 'Tropical Flowers' or 'Flowering Gingers', smaller pure silk scarf valued at $45, plus matching earrings. 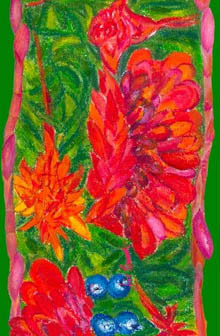 Runners-up - 50% discount on any Tropical Flowers or Flowering Gingers scarf. Check out the hand made sterling silver and glass earrings here. All prizes will be posted to the winners, free of freight charges. Virginia - carefree or demure? 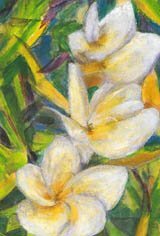 Pink and white scented ginger flowers. 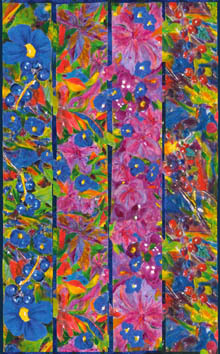 Jill Booth (me) and two other highly regarded Port Douglas artists. Naturally, no correspondence will be entered into and judges' decisions will be final. Midnight, September 30, 2018, Australian Eastern time. "Sounds great - how can I enter?" you ask. Please use the form, below, to tell me that you would like to enter this 'How to Wear a Scarf' photography competition. Images need to be emailed to the address, which will be sent to you after I receive your expression of interest (via the form, below). Except for digitally enhanced images they should be approximately 1mb in size and in the proportion of 2 x 3, approximately, either horizontal or vertical formats. The size is in case I decide to use your images for reproduction in print media. I reserve the right to publicise the competition (and your brilliance!) by using photographs submitted, at which time you, as the photographer, will be credited. Selected entries will be published on this site - here's hoping for a deluge! You are also welcome to tell us something of the fun that you had making the photos. I imagine that would make it even more interesting to readers. What do you think? Good wishes for unleashing your creativity - and for winning those prizes! 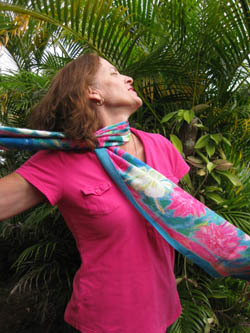 How to wear a scarf - fun photography competition! Photography - Fashion or Fun? Please tell me if you would like to enter this photography competition. Further entry details will then be sent to you. 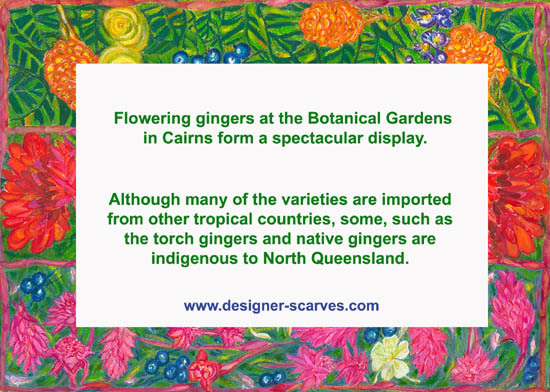 How my interest in the ginger flowers scarves began - sign at exhibition launch. A casual look, which feels so soft and luxurious - a great way to add a touch of colour. 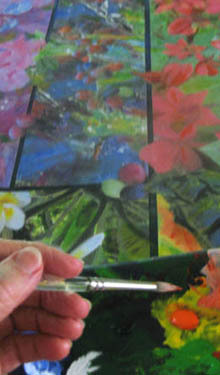 Free flowing hand-painting on silk with fibre-reactive dyes. 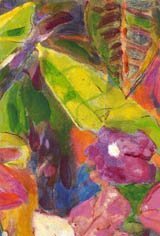 Painting and printing with dyes on heavier silk.